In the year 2001, four disgusting zombies crawled from the stinking cesspools of the Netherlands. 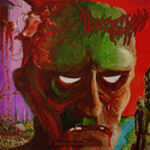 These yet decomposing bodies released an unpleasant piece of gutteral zombie death metal, irritating mainstream mankind. Indulgent to many mindexpanding sins, the corpses slowly began their vomital conquest. After having devoured some drum-players a year from then, Verderf was strenghtened by a new guitar player and drummer. Inspired by bands like Obituary, Mortician and Six Feet Under, the zombies continued to create one deadly song after another, till there was enough material to trouble the earth with an unpleasant demo: 'Drowned in Vomit'. Verderf hasn't any political or religious statements and certainly don't want to suggest more than a piece of misshapen zombie deathmetal. Death, Gore, Zombies, Vomit, etc.